The mod adds many new types of animations for your character to make its action more realistic! 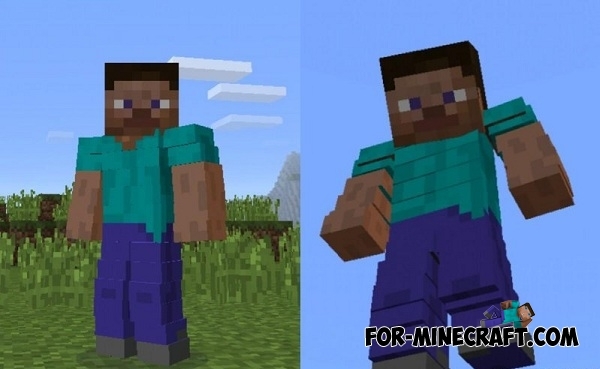 Mod is under development, so you can not play with modified skins, and the animation only works in creative mode. Here is the animation when standing and jumping. As you can see, Steve is slightly flexes the leg and arm when jumping. In the water, your character can swim like in reality, stretching her legs and arms. Finally, Steve can float in the air like Superman (picture on the poster above). Reality Revolx shaders for MCPE 0.14.0Reality Revolx shaders for Minecraft Pocket Edition 0.14 - it is incredibly beautiful shaders!